18, Jalan Marikh U5/177, Seksyen U5, 40150 Shah Alam, Selangor, Malaysia. 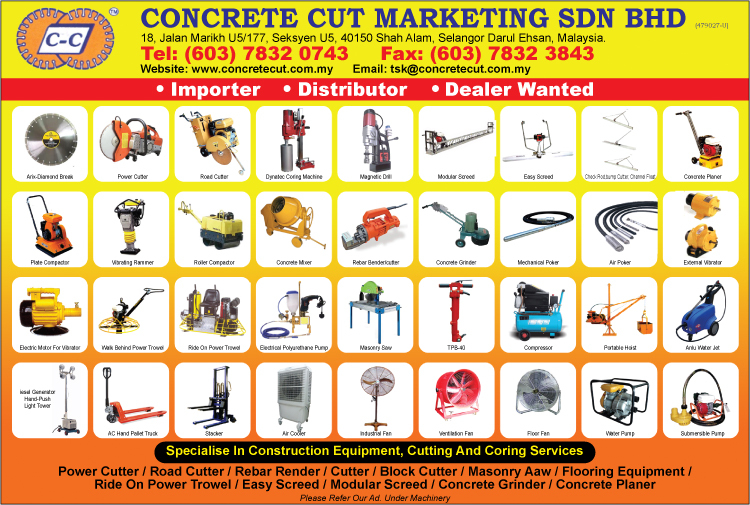 Concrete Cut Marketing Sdn Bhd was established since 1999 and solely owned by local company. Our core business involve trading, servicing and supplying all types of industrial tools and machinery for light construction. Besides, we also provide repairing solutions. Our management team has many years of experience in sourcing, marketing and supplying wide range of quality products especially cater for the construction, and building sectors. We also created our brand name Dynatec. We are committed to provide quality products, services and competitive prices to our valued customers.